Here in Agartala, the weather starts to change from mid- October. Darkness starts to fall noticeably earlier. It rains occasionally- light but stubbornly continuous; and when it does, the sun refuses to show its face for many days in succession. Foreshadowing the shape of things to come, a white mist sweeps in from the West on some mornings and most evenings. The evenings also have the edge of chill in them- faint initially, growing more insistent as the days shorten. Even though the flaming Autumns are absent, leaves start to fall, leaving some trees totally bare by January. Since the sweepers have better things to do with their time than compost the fallen leaves, they just wait for them to get reasonably dry and light fires. The birds do not set up their usual chorus in the mornings. There is a definite lull in the atmosphere- of silence and waiting. 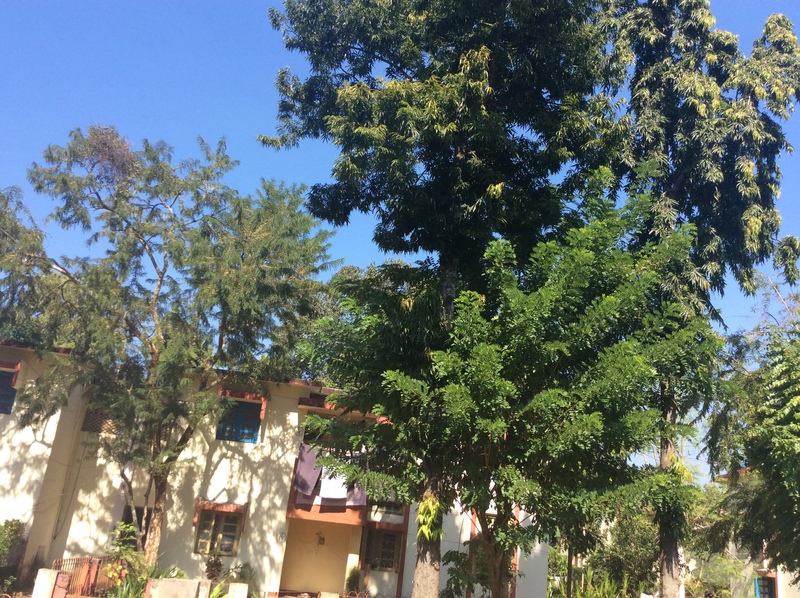 One notable exception is the Parijata trees, which grow abundantly here. Each day I wake up to a fresh and fragrant carpet of last night’s blossoms. But these too peter out by December. My home state, the one which I claim to be from, even though now I have spent more years living outside it rather than within its boundaries, lies to the South-West, nearer to the Equator, and is edged by the sea. The happy consequence of this geography was that I grew up an utter stranger to Winter, which (for me) existed romantically only on Christmas cards, depicting snow covered landscapes. Later, tossed to a town in the foothills of the Himalayas one October, I became the owner of my first woollen sweater at the age of twenty-three. Thick blankets and a room heater quickly followed. That first winter of North India, caught me off-guard; but then, I had the resilience of youth with me and emerged quite unscathed. But today, another twenty three years later, I am in no position of resilience. The cold, damp mist and the absence of sunshine takes a toll on both physical and mental health. I am a sitting duck for stray viruses cruising around; my last birthday was spent in bed, unable to sit up or keep the eyes open, hallucinating wildly, BP dipping down and with a wild thirst ravaging the body. I remember nothing of the journey to or from the doctor; and had to force myself to tell him what was wrong with me. Mercifully, he asked very few questions; being a Homeopath, neither did he prescribe tedious blood tests and antibiotics to subdue the virus; just a tiny vial of medicine- two drops to be taken every two hours. I was fine the day after! Depression and lack of enthusiasm is the other side of the story. Whatever glimmer of warmth or sunshine the day has to offer, is over too soon. The days become an endless procession of chilled greyness. Melancholy tightens its grip- trying to squeeze out all joy and there are days when I fear it will win. Like the Last Leaf in the O Henry story, what sustained me last year was the sight of roses! The rose bush in front of my house, a hardy local variety, blooms every single day of the year- rain or shine. I do not pick flowers- cannot bring myself to do so- and am content to admire the blooms from afar. So pale pink roses it was, not only in December, but January and February too. Autumn and then Winter following on its heels, both seemingly merged into one marching army of depressing days, varying only in the intensity of the biting cold, are also a space for reflection. A time to face mortality and also a reminder that the Great Wheel is turning. A time to hold up a mirror to ourselves and to see how much, if at all, we have progressed. I live one day at a time in winter; trying to be friends with my dark shadow self, feeling the absence of warmth and sunshine, yet fighting to stay above it. Winter has well and truly left! It is difficult to imagine sunshine, while one is in the gray depth of winter, but truly, everything passes. There were days when the sun had all but disappeared. The day would dawn, stilled and subdued somehow because of the fog, which would cloak the outdoors in white and deaden sound. The fog at Agartala is not the smog of cities, but just what it is supposed to be- a silent white presence, which also makes one appear to be smoking, while in the innocent act of simply breathing out! Then, sometime around mid February, a sudden shower- fleeting and brief, which nevertheless brought so many shrubs I had given up for dead, back to ebullient green glory. The thick sweaters were discarded, tentatively at first, since there was still a chill in the air. (This act also gave people the benefit of appearing as if they have all lost weight miraculously!) Then suddenly enough, days of bright sunshine! Glory be! I read about the legend of Marzanna, a Baltic and Slavic goddess, who is the goddess of death as well as winter. 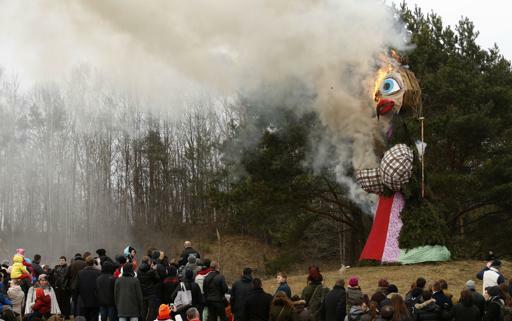 The effigy of Marzanna is made in the month of March and burned to celebrate the triumph of Springtime over Winter. Even though the winter which we have in India may not hold a candle to what that they did, I am wholeheartedly behind them in their effigy-burning enthusiasm! And to imagine that I used to be one who gazed dreamily at the snow-covered landscapes in Christmas cards, which winged their way by Air-Mail from the UK in snow white envelopes (addressed to my father, from his youngest sister), with stamps showing a youthful Queen Elizabeth in profile! (the stamps used to have different colours based on their denominations). At least now I am very clear in my priorites- I enjoy viewing the misty lochs and glens of Scotland and the purple heather of Ireland- from the safety and comfort of my favorite chair in a warm corner of India. It was around the last week of February in the early hours of a morning that I heard the call of the first cuckoo of the season. A rusty call, as if recovering from a bout of pharyngitis; questioning at first and hesitant. The cuckoo’s call is a great wakeup alarm; especially when the cuckoos gain confidence and the calls become louder and more strident. Unfortunately, sometimes their excessive enthusiasm (or hormones?) make them lose track of time altogether. I was woken up one night at exactly 1.30 am- disoriented and groggy- there was a whole concert going on outside! Thankfully, they have now recalibrated their internal clock now, to – 4.30 am!!!! More on night life in a future post ! Note: On hearing the first cuckoo in spring is a tone poem composed in 1912 by Fredrick Delius. It is considered as a perfect evocation of a spring morning in England.